Kirk Alyn sets the herioc standard for generations to come, portraying Superman in these multichapter cliffhanger adventures that kept Saturday matinee crowds coming back for more. The 15-chapter "Superman" (1948) spans our hero's first arrival on Earth to his alter-ego role as reporter Clark Kent through his battle with sinister Spider Lady. In the 15-part "Atom Man vs. Superman" (1950), a UFO and an A-bomb imperil Metropolis. Back 30 years before Christopher Reeve, almost 50 years before Brandon Routh - and even three years before George Reeves – Kirk Alyn became the first live-action cinematic Man of Steel. He played Superman in two separate series of serials. 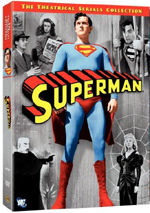 A four-DVD set logically entitled Superman: The Theatrical Serials collects all of these for fans to see. Both serials run 15 parts and span two discs. The package starts with 1948’s Superman. This one gives us the character’s origin story as baby Kal-El comes to Earth from doomed planet Krypton and ends up with the Kent family. Dubbed Clark, he grows up and turns into a super-powerful dude who moves to Metropolis to be a reporter and also act as heroic Superman (Alyn) when necessary. This creates a sensation as the mysterious hero appears on the scene. Clark competes with fellow journalist Lois Lane (Noel Neill) and also pals with rookie photographer Jimmy Olsen (Tommy Bond) at his new gig, the Daily Planet. The movie follows these relationships and Supes’ various adventures, most of which revolve around a mysterious Spider Lady (Carol Forman) and her schemes to acquire a deadly weapon called the Reducer Ray. For the second serial, we move to 1950’s Atom Man Vs. Superman. As implied by the title, this one takes a more direct focus that the fairly general antics of Superman. Lex Luthor’s (Lyle Talbot) gang enacts a crime spree, and he demands all the money from the Metropolis Trust or he’ll level the city. Of course, Superman puts a stop to this, but even with Luthor in jail, crime dominates Metropolis. Oddly, various crooks manage to turn invisible through the use of a special coin. To the surprise of no one, it turns out that Luthor developed this teleportation coin, and he uses it to slip out of jail every night. The evil genius comes up with a machine that he hopes will be able to send Superman’s atoms into the nothingness of space. He partners with a mysterious “Atom Man” to topple our hero. The movie sets up Superman in a poor way. The origin tale is stiff and awkward, and some odd casting doesn’t help. Jonathan Kent looks and acts more like a city slicker than a rural farm man, and teen Clark seems rather pudgy and doughy for the Adolescent of Steel. This doesn’t translate to a smooth, compelling launch to the character. I could get past those issues if Superman ever provided any excitement. Unfortunately, it fails to take advantage of the character’s strengths. All it does is throw a never-ending parade of thugs and goons at Supes. He beats them up and life goes on. It’s all relentlessly dull and monotonous. The movie’s stretches of logic don’t help. When the Spider Lady promises to destroy the Daily Planet building in a short period of time, all of the employees just sit there like they’re waiting for a pizza to arrive! Apparently all Planet employees also know how to fly planes, and Superman has an “anti-Kryptonite” lining for his suit. Bizarrely, one scene finds Supes remaining inactive while Jimmy Olsen fights the goons. Maybe he took a lesson from the cops of Metropolis, as they appear to do nothing. The Planet seems to be the main crime enforcement arm of the city, as everyone comes to the paper to get things done. Even crooks get dropped off there for interrogation instead of with the cops! Across the board, Superman is a dud. Atom-Man manages to work a bit better, at least. There’s more action along with stronger production values. Superman deals with threats other than just thugs, and the camera actually moves around a little. It’s not up to modern standards, of course, but compared to the dreariness of the first flick, it’s an improvement. The story is also notably more involving. Indeed, I get the impression the producers of the modern Superman movies took a little inspiration from this film, as we see some similarities. We get Lex Luthor – a much more interesting villain than Spider Lady – and elements that remind us of the Phantom Zone. Lois suspects Supes’ secret identity and a dam burst threatens citizens. The parallels aren’t identical, but they’re there. We still get too many fights with thugs here, but at least the movie offers some elements to spice up the monotony. Do we get non-stop action? No, but after the non-stop array of faceless thugs in the first movie, I’ll take this one’s slightly varied action over nothing. Of course, more stretches of logic still mar the production. The cops pop up at times, but it continues to appear that the Planet runs things. Also, if Superman has a suit with anti-Kryptonite lining, why not wear it all the time? He could avoid a lot of trouble. In terms of the actors who span both productions, most do okay. I actually really like Neil quite a lot. She fits Lois well. She’s no beauty queen but she’s cute, and she seems spunky, steely and sharp – when the script allows. Neil is the best thing about these flicks; I wish the producers of Superman Returns could have found a Lois half as good as her. On the other hand, Alyn is pretty terrible as both Clark and Supes. He makes the characters seem like morons, a problem especially in terms of Superman. It’s okay to show Clark’s foibles, but Supes usually comes across like a dope. Alyn isn’t strong, powerful or intimidating; he’s just a goofball in tights. As a life-long comic book fan, it’s a treat to get a chance to look at Superman’s earliest live-action cinematic adventures. I just wish the stories were more interesting. These are good for curiosity value and little more. 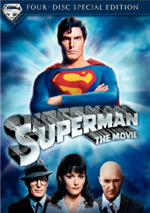 Superman: The Theatrical Serials Collection appears in an aspect ratio of 1.33:1 on these single-sided, double-layered DVDs; due to those dimensions, the image has not been enhanced for 16X9 televisions. While the shorts looked better than I expected, they remained pretty average for their age. Sharpness was a notable concern. Though most of the shots appeared acceptably concise and accurate, more than a little softness interfered. A fair number of scenes looked less defined than I’d like, though I remained pleased with the general level of delineation. Jagged edges and shimmering were minor at worst, but I noticed some edge haloes through the episodes. Source flaws presented surprisingly few distractions. Occasional examples of lines, marks and specks appeared, but these seemed less prominent than I anticipated. The shorts usually looked pretty clean. Blacks were acceptable, though they tended to be a bit gray. Shadows were similarly decent but not exceptional, as the low-light shots stayed visible but weren’t particularly dynamic. At times the elements came across as too bright and overblown. The softness and lackluster sense of black and white balance led this one to a “C+”, but I do want to reiterate that the shorts looked better than one might have expected for material of this set’s age and origins. As for the monaural audio of Superman, it seemed similarly acceptable but mediocre. Effects showed somewhat rough tones at times. They displayed decent low-end heft but suffered from a little roughness in the higher registers. Still, those issues weren’t substantial, and the effects stayed reasonably concise. Speech followed suit. Though the lines could be somewhat brittle and edgy at times, they usually stayed fairly clean, and they were consistently intelligible. Music showed fair breadth and range, though the score seemed moderately constricted, as one would anticipate from material that nears its 60th birthday. Some background hiss created minor distractions, and I noticed a little popping as well. This was a mediocre track but not a bad one for its age. Only a few extras round out the set. Saturdays with Superman fills nine minutes, 18 seconds as it looks at the serials’ theatrical appearances. We hear from authors/historians Jan Henderson, Gary Grossman, and Jim Harmon, writer/director Donald Glut, historian Bob Burns and actor Noel Neill. “Saturdays” looks at the history of serials as well as how Superman came to the big screen. We learn a little about casting and performances, visual effects, and other production elements. Though a few decent notes emerge in “Saturdays”, mostly we get a lot of happy talk. The participants wax rhapsodic about the good old days and this series. We don’t really learn a whole lot about the shorts or the participants, as the remarks stay quick and superficial. This is a disappointing featurette. We also find a six-minute and 25-second excerpt from the feature-length documentary Look, Up in the Sky! The Amazing Story of Superman. 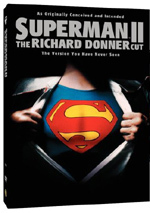 It presents notes from Neill, Superman Returns director Bryan Singer, Superman director Richard Donner, and actors Jack Larson, Margot Kidder, Dean Cain, Annette O’Toole and Brandon Routh. 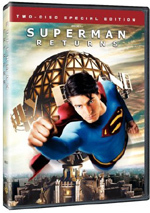 Mostly “Sky” looks at Singer’s thoughts about various live-action incarnations of Superman, though the actors and Donner throw in some notes about their experiences. This is nothing more than a teaser for the full version of “Sky”. The show doesn’t even mention the serials! It’s pretty useless in excerpt form. Should fans expect anything from Superman: The Theatrical Serials collection other than historical curiosities? Not really. The shorts have some good elements, but all the flaws submerge these, especially during the first series. They’re just so darned dull so much of the time that they’re tough to watch. The DVDs provide average picture and audio along with a couple of minor extras. Leave this set to the Superman completists.